Whether racing or cruising, Quantum Pacific’s Will Paxton explains how to use spy tradecraft to position your crew for success. So now that you’ve found a few good crew who wants to go sailing with you on a more or less regular basis, how do you take it to the next level, to build that crew into a team? Quantum Pacific’s Will Paxton says the answer can be found in any spy novel. “My own brand of organization on a sailboat is called ‘tradecraft.’ In spy novels, that’s how the CIA teaches their operatives to work in a chaotic environment. Tradecraft is learning to prevent everything that you can anticipate, so you can spend your time focusing on that which you can’t anticipate—that’s how you set yourself up for success,” he says. Tradecraft is making sure the trimmers always have a role of tape in their pocket to mark lines on the deck or sheets to ensure that whatever you’re doing is repeatable. For boats that need active rig tune, it’s having a rig-tuning chart and one designated person who makes sure the rig is back at base at the end of the race. And when you’re out for a weekend cruise with friends and family, it’s your safety speech, letting your guests know where the life jackets are, where the fenders go, where the open thru-hulls are, and reminding them not to block the head. 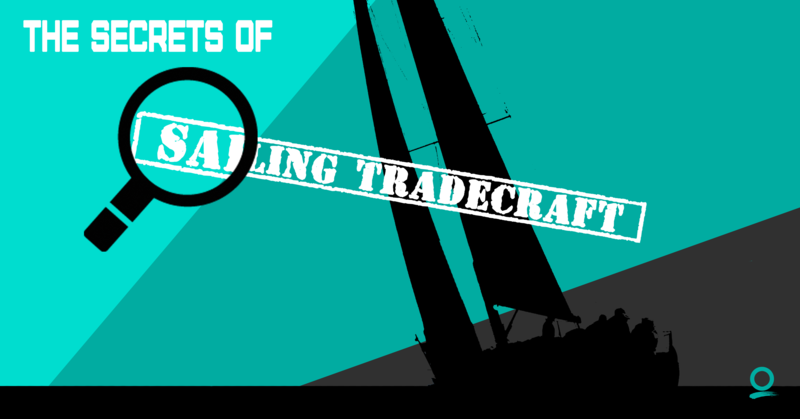 You don’t have to be a pro to make tradecraft work—it’s applicable to both to racing and cruising boats, experienced crews and amateurs. “I’ve sailed on boats stacked with pros where too often their egos and experience are getting in the way, but on a boat full of Corinthian sailors who regularly sail together and are willing to work with each other, things go a lot smoother,” Paxton says. There are four main elements to tradecraft: leadership, communication, training, and repetition. Tradecraft is achieved in layers, and it starts with the little things, as small as tying (or not tying) stopper knots in the lines. As a boat owner, the first step to implementing a tradecraft system is spending enough time with your boat to understand what works best, and then you need to be able to communicate that clearly and calmly to people. If you don’t know what you expect from your crew at any given time, they won’t either. “I have it down to the point where I tell you where to put your hand first when you get off the rail to put the kite up,” says Paxton. Out on the water, one person, usually the boat owner or the tactician, whoever is calling the plays, is in charge of tradecraft. Having a clear, concise countdown for every tack and gybe ensures that no one gets off the rail early or cuts a sheet too late. Paxton says the most effective communication on the water requires no words at all. Each section or position on a boat should have a responsibility, and that responsibility has to mesh with the section next to it. “Everybody should know what needs to happen and be tuned in and waiting for their cue. When the kite goes up, the bow secures the jib, gets the luff in the track and puts the frac on. When they’re finished, they turn to look at the pit, who should be ready and waiting to close the halyard clutch,” he says. Eye contact is key! None of this can be learned on the fly—it takes training and repetition to work, but you don’t have to spend every weekend practicing either. “Tradecraft is showing up an hour early to the start. Doing a few tacks, a set, a gybe, and a combat takedown (i.e. jib up and kite down around a real or imaginary mark). If you can find another boat to tune up with upwind, that’s ideal,” Paxton adds. Again, repetition is key. You want to do the simple things the same every time, from how you cross the boat on a tack to who is in charge of flaking the spinnaker halyard. If you keep changing up procedure, it won’t ever become automatic. Systems will change as boats evolve and grow, and when adding new skills to the playbook, just make sure there’s ample time to discuss and practice a new system before you have to use it. Tradecraft won’t come all at once, but with a little desire and dedication, it will. Leadership, training, and good communication skills will set up you and your crew for a successful sailing season as a cohesive team! Our next post in this series is on prepping your boat and your crew for a signature regatta. Do you still need to get that great, loyal crew? No worries, we've got you covered; check-out these to get the great tips from our earlier posts in this series: How to Find a Few Good Crew and 5 Simple Ways to Keep Your Crew Happy and Loyal!